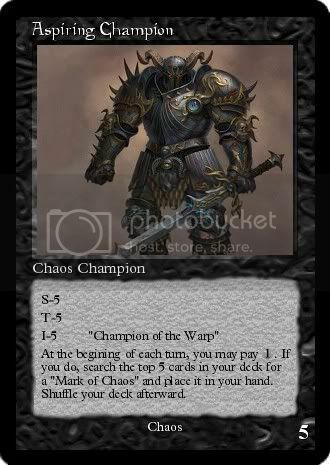 For those of you who know, a while ago I made up some quick reference cards using CCG Maker I downloaded off some website. 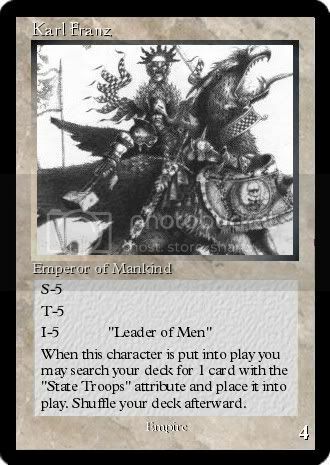 Anyone interested in a Warhammer Fantasy Card Game? Obviously it would evolve to include 40k, but to keep my brain on one path I'm sticking to Fantasy. I wouldn't be selling anything, so can anyone foresee any copyright issues? I'm not particularly familiar with the U.S. rules, so any advice would help. Dis iz my Choppa. Der iz many like it but dis one iz mine. Wifout it I am nofing, wifout me it is nofing. 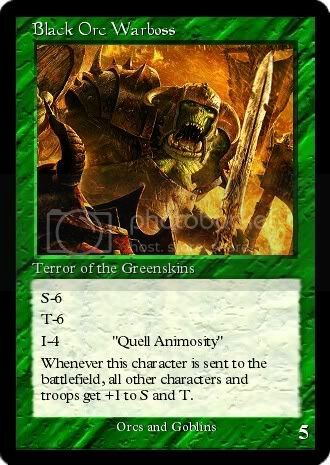 Re: Warhammer Fantasy Card Game? It is a ton of fun!!! You would inevitably run into legal issues, as you're dealing with GW's intellectual property. However, if it's just a bunch of kids hanging out in a basement playing with home-made cards, how would they ever know about it? Heres some of the cards. Of course they aren't finished yet, and I still need to get some input on card ideas and balance. any advice is welcome. Those look pretty cool, man! I was never a Magic kid, but this looks pretty interesting so far. My thought for the game is you have several characters to choose from, along with them many other troops, war machines, etc. Then you have Items, Magic, Battlefields, Events, etc. Everything costs a gold value, which is the lower right number. the higher the number, the more valuable the card is. Obviously, as the game progresses stronger characters and more powerful cards will come out, which is why i need input from everyone else to help me think of some ideas for cards.